SocialToaster has a unique story in the Marketing Automation space. Its platform leverages the social networks of your stakeholders: customers, employees, vendors, or anyone else that could potentially and voluntarily be “Ambassadors.” By opting into a program as an Ambassador, participating stakeholders can help to drive traffic to a site and increase a company’s the marketing reach. When a company creates and publishes a message, Ambassadors are immediately given the option to re-publish, without re-formatting, that message onto their Facebook, MySpace, Twitter, and LinkedIn accounts. Each SocialToaster post appears to come from the Ambassador themselves, which influences their followers to click through at a higher rate than online advertising. And since each Ambassador posting contains a unique URL. 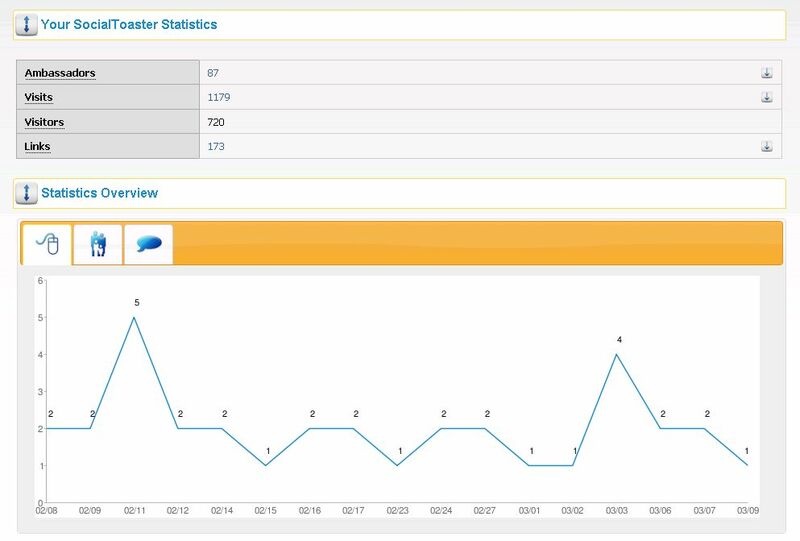 SocialToaster can then track the process from click to lead capture to sale, which is reported in a dashboard format. We mentioned earlier that this is no ordinary interview- Allinio is also a partner and customer with SocialToaster and wholeheartedly recommends this great way to get your content out. Through using the SocialToaster platform ourselves, Allinio can attest that the Ambassadors have driven an majority of its website traffic with each blogpost that is configured to go to those Ambassadors (you should judiciously determine what posts you want to go through the Social Toaster network, because you don’t want to bother your Ambassadors too frequently). Allinio: How does your product/service allow Marketers to better gather, analyze, share, and act upon data? Who can you potentially reach with your content. Who your direct audience is, and how are they helping you promote your content. What content is most effective in terms of engaging your direct audience in the act of sharing. What content is most effective in terms of driving extended engagement and traffic, once shared by your network. Which individuals are benefiting your organization most in terms of their program participation. What is the ROI that the use of SocialToaster is providing. Allinio: Please explain to us the value proposition of your product/service to Marketers? Razzaque: Although the reporting and analytics are extremely valuable, SocialToaster’s primary value proposition is that it is one of the only solutions that allows a Marketer to proactively promote content out through a large network of people at the Marketer’s direction, but to subsequently have that content shared through personal social networks in an organic word-of-mouth fashion. Allinio: What is a common misconception that the market has about your product/service? Razzaque: We are often mistaken for either a social analytics tool, such as Radian6, a social content publishing and management system, such as HootSuite, Argyle Social, or Vitrue, or an ad-hoc passive promotion tool, such as ShareThis, AddThis, or even 500friends or Zuberance. Social analytic tools tend to monitor the streams for engagement around a specific search term. Social publishing systems tend to make it easier for a Marketer to manage their existing social properties, such as a Facebook Page or Twitter account, or to manage the people within the organization tasked with managing those properties. Finally, ad-hoc promotion tools rely on existing traffic or activity on a page or site to prompt an individual to share or participate in some sort of engagement activity. The resulting activity then happens arbitrarily over time, and generally is not concentrated around a single focus. SocialToaster is unique in terms of trying to help promote specific pieces of content through a large audience over a short period of time–the problem of “going viral” or amplifying specific messaging. Allinio: What is the most successful or innovative use of your product/service by a business to date? Allinio: What is your greatest challenge as a marketing organization? Razzaque: Our greatest challenge is educating our consumer on what our product is and how it is different. The social media space is exploding with a number of interesting an innovative solutions, but the typical consumer is still at the phase where there primary concern is growing their Facebook Fanbase or getting more followers on Twitter. Sophisticated organizations are learning that this should not be a primary end-goal, as growing fans and followers doesn’t generally translate into activity or action that benefits the organization. These are the organizations that are best suited to evaluate the new solutions coming out, but they are few and far between. As such, it is a challenge for us to identify which organizations are most suited to adopt our product, and to educate potential customers that are not quite there yet. Allinio: Brian, thank you for your time and good luck with SocialToaster in 2012 – we LOVE the results from it!